We now have two Sample Storage Boxes to accommodate our VACUTAINER® Tubes. Made from durable cardboard, medical laboratories, forensic laboratories, and hospitals will find these boxes extremely convenient for storing filled vials. These boxes are suitable for incubators, refrigerators, deepfreeze, and controlled atmosphere applications. Compact space savers offered in a variety of sizes. Ideal for the storage of liquids, powders, small specimens, etc.... Each set includes a partitioned box, vials with caps, labels, reference chart, and an exterior card holder and card. Alpha-numerical indexing system allows quick identification and location of stored items. Threaded glass vials with plastic lined caps. The same as our screw cap series, but with Poly-seal caps and a cone shaped polyethylene liner. Poly-plug, Knurled snap-caps are friction fitted with glass shell vial, straight sided, and a flat bottom. For vial sizes of 10 and 12 dram please call us for prices and availability. A large size storage set. It comes with square clear glass bottles (1-ounce capacity)and black screw caps with plastic linings. Most economical, straight-sided, flat bottom, glass shell vial with high quality cork closures. Ideally suited for storing small parts, geological specimens, soil and many other types of samples. Vial size 3 dr (10.4ml), 12 mm dia x 114 mm H, arrangement 5 x 20. Tray size 11½" x 3" x 5"
Our unique membrane storage boxes for the transfer, storage and shipping of many delicate items. Available in 5 different shapes and sizes these plastic containers, with a double elastic membrane on the top and bottom, offer security for all of your sensitive items. Once your item is placed in the box the elastic membrane conforms around the enclosed object and protects it from any movement. Patented gel technology – the innovative solutions for storage and carrying delicate materials. The traditional Gel-Box, Gel-Tray®and Gel-Slide Carriers are perfect for applications where devices are manually offloaded by tweezers or by hand. Gel-Box (AD Series) - Hinged plastic boxes coated with Gel in the bottom. 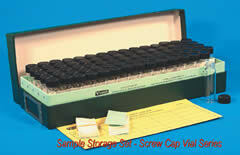 Gel-Tray® (BD Series) - A removable 2" plastic tray coated with Gel and contained inside a hinged plastic box. Gel-Box AD Series Carriers owe their unique device-holding capabilities to a proprietary GEL coating applied directly to the bottom of a hinged box. Devices are held once contact is made with the GEL surface and will stay in place, even if the carrier is tilted or jarred. The carriers are designed for manual off-loading with tweezers or by hand. GEL-PAK AD series are ideal for handling devices where no direct contact with the top of the device is important. 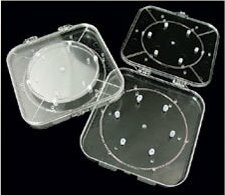 The GEL-BOX Carriers may also be used for bare die handling, such as GaAs, PETs, laser diodes, and beam-lead devices where the die size is small (less than 1 mm) and tweezers or other specialized techniques are used for off-handling. No need for custom-molded containers for each device size. Ideal for handling subassemblies, hybrid models and packaged devices. Available in Transparent, Conductive and Anti-Static carriers in multiple sizes. We offer standard retention level X4. Other retention levels are available with the order of 100 or more, and at least two weeks. Same as the Gel-Box, the Gel-Tray and Gel-Slide products are intended for manual applications in which the devices are loaded and unloaded using tweezers or by fingers. The Gel-Pak BD and CD series of pocketless trays are both configured as a 2" carrier stored in a protective plastic hinged box. The Gel coating is applied directly to the surface of the plastic tray (BD Series) or glass slide (CD Series). These products offer the same functionality as the Gel-Box, however the plastic tray or glass slide can be easily removed from the box allowing for convenient handling when loading or unloading fixtures are being used. The Gel-Slide (coated glass slides) is designed for higher temperature applications such as bonding and reflow where a plastic tray will not work. The CD slide has a temperature capability up to 220°C. The CD glass slides are also ideal for backside inspection due to their optical clarity. Both the Gel-Tray and Gel-Slide products are available in the standard retention levels (X0, X4, X5, and X8) to accommodate variations in device size, weight, and surface roughness. The protective 2" hinged boxes are available in transparent styrene (T), conductive black (C) and antistatic (AS) materials. The boxes, trays, and slides may be customized with a print pattern (grid) or company logo. 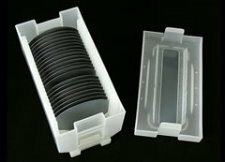 EMS now offers several new types and sizes of containers for either storage or shipping of wafers in a variety of sizes (any material) from 1" to 6" in diameter. These containers are made from polypropylene or polycarbonate and prevent all types of damage and contamination to the wafer during shipping and even in storage. Each of the containers are packed in class 1000 cleanroom and bag. The set includes the container, the cover and the spring. The containers feature a conical base to support the wafers on their edges; the wafers are held in place by the spring. 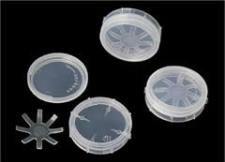 The multi-wafer containers are made from polypropylene and have a storage capacity of 25 wafers maximum. They come complete with the base and cover. The single containers will accommodate a variety of sizes from 4" to 6" by simply adjusting the silicone supports in the box. These containers are made from anti-electrostatic polycarbonate and are available in transparent or black. The set includes the container, the cover and the spring. The clamshell containers are transparent polycarbonate available in transparent or black.